​Ahhh, how I love Amos and the rest of his Bible buddies, the so-called “minor prophets.” I used to think “minor” meant “less important,” but then I went to seminary and my professors filled me in on the fact that they’re “minor,” because they’re short, compared to the “majors,” Isaiah and Jeremiah. All the “minors” fit nicely onto the ancient scrolls where the Old Testament was originally written down. These “minors,” including Amos, offer readers major lessons when we stop to read them. ​to the remnant of Joseph. ​What does it meant, practically, to hate evil? Hate evil… refugee children struggling for food and shelter while the world sits on the sidelines in silence. Hate evil… discrimination of another because of social class, education status, gender, or race. And what does it mean, to then love good? Love good… emergency professionals risking their own lives to respond to terrorism and acts of violence. Love good… aid workers who treat the sick and starving around the world. Love good… missionaries working to establish justice for the marginalized around the world. 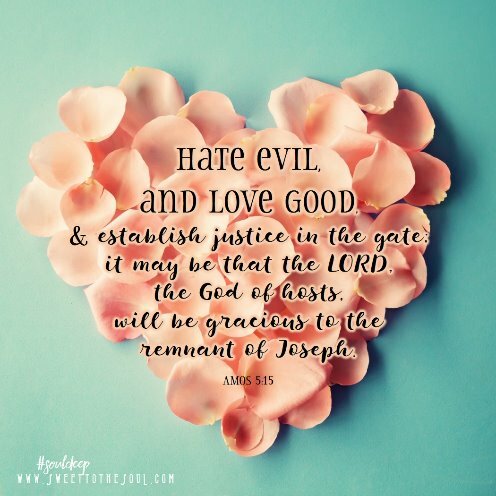 When we hate evil and love good, we then move on to a responsibility to establish justice at the gate. In ancient Bible times, the city gate is where people came to be heard and seen – to plead their cases, to conduct business, to learn about important happenings in the community, or, in this case, to stand up for, or “establish,” justice. Today, we might not all have city gates where we can establish justice, but we do have our own communication platforms. 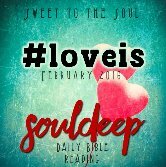 We’ve got blogs, small groups Bible studies, Facebook pages, Twitter accounts and don’t forget Instagram! 1. When evil happens, find the good and love it by sharing it Have you noticed that after a tragedy strikes, amazing, heroic and truly good people show up to help? After the next shooting, bombing or other disaster, take some time to look for the people who show up to help. Their stories aren’t always immediately easy to find, and it might take some digging, but they’re there. Share their links on Facebook, blog about their actions. Donate to their organizational efforts if you can. Pray for them, alongside the victims. Don’t discount even small opportunities to show the world that you love good. 2. Establish justice in our own lives. About a year ago, I decided to declare a “zero tolerance” personal policy of discrimination. When I see injustice happen, I say something about it. I try to speak truth in love to friends making off-color jokes about someone different, I respond to discriminatory comments online when I see them, I intentionally build relationships with people whose lives look much different than mine. Not as a political statement, but because I love God, I love His Word and I want to love as He does – with justice in mind. As I’ve lived out my commitment, my life has become a reflection of God’s commitment to justice. My actions have opened opportunities for conversations about my commitment. What started with me became a ripple effect across my community. 3. Give glory to God for His amazing grace. Our commitment to living out the Bible is all a reflection of who God is. We can never measure up 100%, but we can show the world a small glimpse of who He is. A God who hates evil, who loves good, who establishes justice. When we make life changes that reflect positively on God, let’s give Him all the credit and glory for being who He is. When the body of Christ comes together to hate evil, love good and establish justice, we reflect God’s graciousness onto a hurting world. And what could be more sweet to the souls of the world than that? ​Christa Cordova is a mom, ministry leader at Read Pray Move Ministry, and full-time masters student at Princeton Theological Seminary. When she’s not working on class or ministry work, you can find her in the kitchen working with fresh, whole, healthy foods, or outside hiking trails around her home in Central New Jersey. Great words, Christa. It struck me as I was reading how much of a responsibility we have to show justice, not because we should, but because it brings glory to God and the world needs to know God is a just, loving and good God.